But what about Quality (with or without a big Q)? Is quality or Total Quality now passé, having been supplanted by Lean and/or Six Sigma? Are all of these synonyms? Are they just dressed-up, consultant-speak ways of describing historic “best manufacturing practices?” Do they work together, or do they sometimes “compete” as alternatives for improving a business and its operations? We’ll try to briefly characterize Quality, Lean and Six Sigma and, hopefully, bring some clarity to how they work and highlight where they are most exploitable. done right, attacks and reduces scrap and “waste” in all of its forms. The worst form of scrap or waste is a sub-par product or service that gets to a customer. Not only are the materials and labor that went into the product/service wasted, but the customer is unhappy, the brand is damaged, and the faulty product or service has to be replaced or credited. In a manufacturing operation, effective Quality systems reduce material setup and run scrap; a related emphasis is beneficial in every business, but particularly in material intensive businesses. focuses on productivity, going after unnecessary labor, motion and movement, corresponding work-in-process and other inventory, and anything in a production system or supply chain that is not valued by end customers. As Lean principles are effectively applied, processes in an operation will tend toward flowing in a synchronous fashion, ideally at a pace that matches customer demand. Lean efforts add the most value in labor and inventory intensive activities and operations. reduces variability in manufacturing or business processes. Six Sigma entails a set of tools and processes that are used by Quality and Lean practitioners to find and resolve the sources of process variability. Businesses with big or complicated processes (e.g., high-volume production lines such as paper mills or packaged goods) have found Six Sigma techniques to be particularly exploitable. They use common tools of which the most robust is Value Stream Mapping (VSM). provides a complete view of any process and where waste and shadow systems exists. This is perhaps the best tool in which to begin the process of Lean Thinking. Read a recent article on this topic here. Each of these areas comes with its own limitations and watch-outs. For example, left unchecked, many Quality leaders may push for improvement or design efforts that strive for “perfection.” These practitioners often need to be reminded that “perfection is too expensive” (and the corollary: over-design is a form of waste). The challenge with Lean efforts often pertains to work force resistance, as Lean efforts done right yield labor reductions. Traditional Japanese companies applying Lean principles, and companies like them, often assure employees that Lean efforts will never cost jobs, banking on redeploying workers in support of the business growth resulting from Lean activities. Another prominent challenge with Lean efforts is sustaining initial gains, particularly with companies that are earlier in their Lean journeys; Lean is as much a philosophy and cultural emphasis as a set of practices. Six Sigma methods emphasize “doing things right,” but on their own may not identify “doing the right things”—to address this, progressive Six Sigma practitioners heavily weigh the “voice of the customer” to ensure focus on the most opportune areas. To identify the most opportune processes to address, Six Sigma efforts employ Quality and Lean practices such as value stream mapping and determining the cost of poor quality to establish the best processes to go after. Another area where progressive Quality, Lean and Six Sigma methods work together is in the area of product and process design. A “Lean design” builds quality into the product/service and related manufacturing and supply chain processes at outset, minimizing opportunities for scrap, avoiding over-design, establishing work flow with little wasted movement, dead time or inventory, and yielding robust processes that are measurable and controllable. As well, Six Sigma methods are often applied by Quality practitioners in efforts to reduce scrap or Lean champions striving to improve productivity and/or synchronize production flow. The dynamics of a particular business, including where its culture is developmentally, will dictate how exploitable Quality, Lean and Six Sigma methods are and how they might work in harmony. Our opinion is that every business benefits from effective Quality systems and practices, most businesses will improve markedly by getting “Leaner,” and many businesses stand to gain from thoughtful, targeted Six Sigma efforts. Group50® specializes in the application of Lean techniques throughout a business. We know which tools are appropriate for a business and how to implement them as part of an overarching Lean Thinking program. 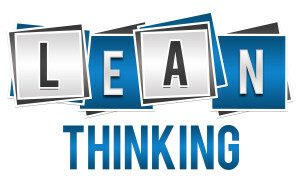 We recently published an article on Lean Thinking tools which you can see here. Below is a list of tools and techniques we use to implement Lean throughout an entire organization and help a company develop a culture of strategic execution. Lean and Six Sigma by themselves aren’t the answer. In a vacuum, Lean and Six Sigma initiatives will often fail. They need to be part of well thought through organizational development and business strategies. About the author: Jim Gitney is the CEO of Group50® and specializes in the development and implementation of lean manufacturing and supply chain strategies. Jim and the Group50 team are all former executives with well-known manufacturing and distribution companies who understand what it takes to put together and manage the implementation of Lean Thinking strategies. Group50 has designed a series of strategic assessments, workshops and strategic execution tools that eliminate the existence of Anti-Strategy. You can reach us at (909) 949-9083 or send a note to info@group50.com. I am interested in determining why LSS does not thrive in the biopharma and pharma world as it does in other industries. In many cases, an applied LSS culture either fails miserably, or only partly succeeds. The result is cynicism and a judgement that LSS is a fad (when we know it is not). I am looking for a comprehensive analyses (if one has been performed) on the contribruting factors of the failure(s) and how they may be addressed. As a next second, I want to determine what LSS looks like in the biopharma industry. What does a biopharma-centric curricula looks like?